Katie Chappell Illustration & Design: Back into college mode! I actually did some work today, hooraah! I put the line test onto a CD... it took me a whoole painstaking 2 minutes to do, but I feel better for having done something. Another failed attempt to get in touch with Sam - I think he's allergic to technology. Either that or his phone is broken/he's gone blind/he's forgotten how to use the internet/his fingers have dropped off/he cant read/he's left his phone on a hot air balloon and it's floating over the desert somewhere... so he cant use his phone. 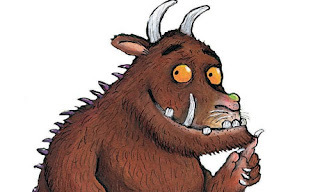 Did anyone watch The Gruffalo on Christmas Day? I loved it!!!! Waaagh I want to watch it again, hope it comes out on DVD or something. UCAS application is coming along. I filled in all my qualifications yesterday and wrote a draft for the dreaded personal statement. Planning to get that finished off by tomorrow ideally. Bah! Humbug!